Simply put, Social Media is a set of tools that we use to communicate and socialize. Social Media can also refer to the content created with these tools. Overall, Social Media is the concept of having a two-way, dynamic, online conversation with your audiences. It is a fact that people read, share and engage more with content that surfaces through friends and people they already know and trust. Social Media enables brands to gain online fans and followers that can influence their circle of friends on behalf of the company. The Internet has transformed communication from a one-way, controlled message into a real-time dialogue with millions. Whether you invest in it or not, the ‘social’ conversation about your brand will take place. By participating in the conversation, you will be able to influence how your business is presented and talked about. More importantly, you can provide information about things that your audience cares about, and become a trusted ‘go to’ source (just like a friend). 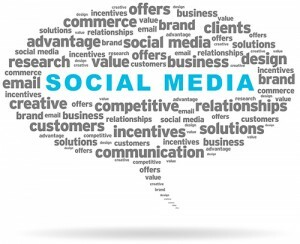 Contact Us to learn how you would benefit from our Social Media Services.